People have been telling me for months: “Ya gotta try the Caramel Apple Cookie from Karamell-Küche!” Seriously, I’ve been bombarded with suggestions to sample this one and get it on the blog! But could it really be that fantastic? 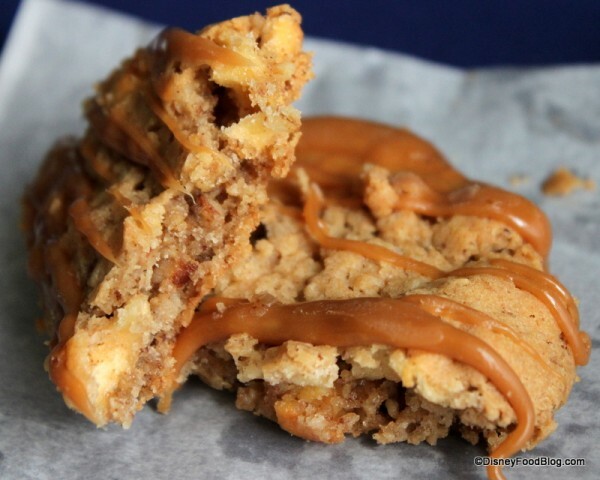 An oatmeal apple cookie with some caramel drizzled on top? I can tell you that it was absolutely worth the effort and extra trip that I took to Epcot’s Germany Pavilion just to sample it. The very moist, soft, and HUGE treat had that great, rich buttery flavor — the mark of a truly fantastic oatmeal cookie. While the apple chunks inside were obviously dried, they were plump and flavorful all the same. The artful drizzle of Werther’s caramel isn’t over the top, but offers a good complimentary taste and texture. The big challenge here was restraint; it was very hard not to scarf down the whole thing in one sitting, despite its massive size. 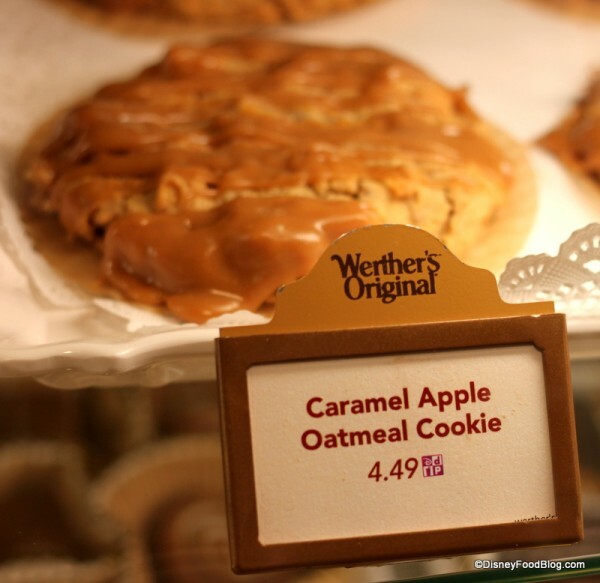 Is the caramel apple cookie from Karamell-Küche on your must-have snack list? And if finding the best of the best snacks in World Showcase is your favorite pastime, be sure to check out the DFB Mini-Guide to Epcot Snacks for all of our favorite finds! Disney World “Just the New Stuff” Snack Crawl — Epcot Edition! Alright, I’m sold. 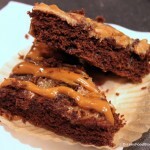 Usually the idea of caramel and apples doesn’t tempt me too much, but that cross-section photo made me want to try one of these on my next trip. It reminds me of this caramel apple crisp I’ve had from a bakery near where I grew up, which is just fantastic. It’s definitely on my list. The next time I am at Epcot, I will be getting more than just one. That looks amazing. We just got back from a week at WDW. We ate and drank our way around the world and. Somehow I missed this. I know my man will love it. Adding it to my list for our Dec trip. Yum. Love this cookie! I always have requests to bring some home. My favorite thing to do with this cookie and buy a few, wrap them up for later. After the parks, when I’m in my room, I take the cookie to the microwave and heat it for 10-15 seconds. This takes it over the top, I great midnight snack. I’ve never tried one of these, but the photo you have of one broken open may tempt me to try it next time I’m there. It looks like there are whole chunks of apple in it! ive never tried the fab cookie,but on nov 23 i so will!!!!!!!!!!!!!!!!! !it looks so delicious!!! This cookie was AWESOME!!! We had it in April. I was shocked it was so good! 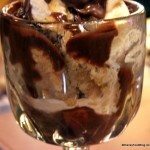 I’d highly highly recommend this cookie – spectacular! This is the best thing I have ever eaten with the word oatmeal in it. Seriously I have been trying to get the recipe for this for a couple of years. Not one recipe I’ve tried has lived up. And I’ve tried a few. They haven’t given out theirs yet. I had one of these on a Collegiate DECA school trip in May 2011. I was just under the legal drinking limit (and the only person in the group that was, *grumble*), so I had one of these while everybody else had beer and pretzels. I think I came out better in the end, though. It is still by far one of the best cookies I’ve ever had. Period. Last week we tried 2 cookies (this one & the caramel filled chocolate). Both were amazing! Super moist & great flavor. I could go for one right now…sigh. This cookie sounds great! I will try it next time I am there. 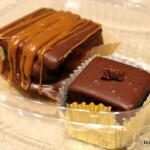 My last two visits, I have been disappointed that there were no cupcakes at Werthers. I will try this instead. Wow, this cookie looks so yummy! 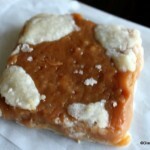 Now I have a problem as my next treat from KK was gonna be the caramel covered shortbread. I guess to solve the problem my only option is to get both!! Maybe I will share since I have to get 2,(maybe)! I am here at Epcot right now and OH My GOD! The cookie was amazing! It was worth the 15 mins wait! Phil Bell — GREAT to hear that!! Have a fun weekend! My brother and I were allowed to go off on our own at Epcot (we were 11 and 14 at the time) and we decided to stop here. My brother got the caramel apple cookie and I got the marshmallow caramel after waiting in line for 20 (!) minutes. After we left the store, we found a Kodak picture spot, so we stopped there. There was a duck in the lagoon, and my brother fed it part of his cookie. The duck choked on the cookie, but eventually spit it out. We were laughing so hard! 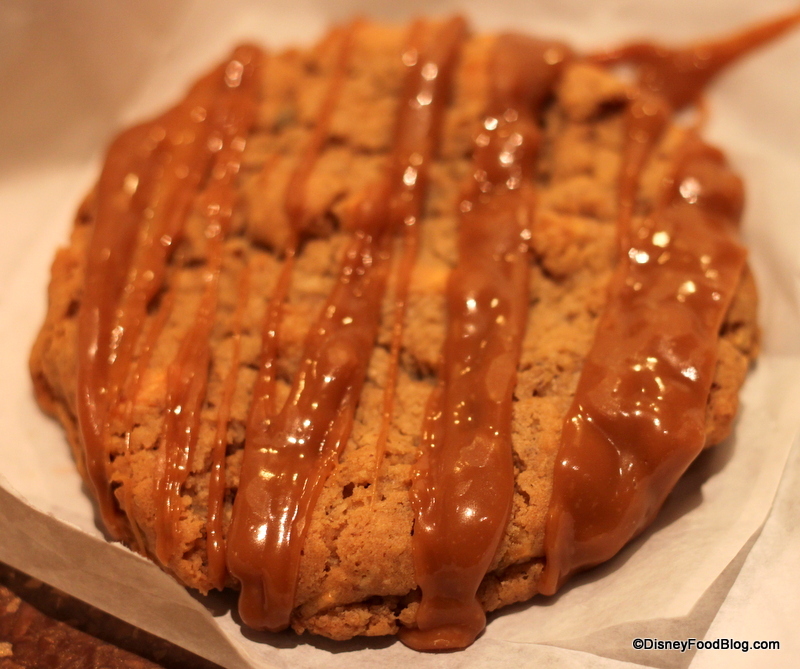 It was one of my favorite moments of our trip, and now every time we go to Epcot, we always feed a duck a caramel apple cookie and we just laugh and laugh, and our mom never has any idea why it’s so funny! This one cookie is delicious and a very special memory for my brother and I. Can these cookies be purchased online to be shipped to your home? Jan — No, unfortunately, Disney doesn’t offer this as an option currently. 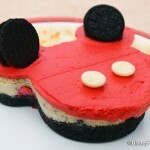 We went to Disney this past summer and I did stop in and buy one of these cookies while visiting EPCOT. I will tell you, it is worth EVERY SINGLE calorie and cent you pay for it. It was heavenly. I’m a sucker for anything caramel-y and although I was skeptical of the apples in the cookie, it was amazing! You have to try one.